Jordan Ingram interviewed Oregon Football defensive lineman Alex Balducci yesterday for FishDuck.com at the University of Oregon Hatfield-Dowlin Complex. 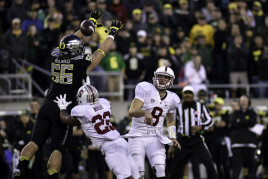 It’s not often that linemen make the headlines, especially for the Oregon football team. With such a potent offense, the Ducks’ defense often gets overlooked. However, many fans got to know the impact players on that side of the ball; Ifo Ekpre-Olomu, Tony Washington, Arik Armstead, and Erick Dargan, to name a few from last season. But there is another lesser-known hero of the defense, and his name is Alex Balducci. Balducci has been steadily improving since his arrival at Oregon from Central Catholic High School in Portland. In fact, he was one of only six defenders to start all 15 games last season, where his 621 snaps ranked second among defensive linemen. Alex, a senior in 2015, is a versatile defender who can play multiple techniques — gap responsibilities, hand placement, etc. – in the middle of the defense, and even played at the defensive end position last season. With spring practices in full swing, Balducci spoke about what he is working on during camp. This mindset is paramount to Oregon’s success. With the defense on the field so often, it’s important for players to be able to play multiple positions and techniques. As an interior lineman, Balducci doesn’t fill-up the stat sheet, but his teammates and football fans alike know everything starts up front. Balducci is right. Placement on the interior can help defenders shed blocks and disrupt the offense’s flow before it gets started. Being able to master the proper techniques and placement is what makes a lineman great, but becoming a master of your craft usually takes time. Oregon fans could see one of the best defensive units the Ducks have had in awhile. And with unsung heroes and seniors such as Balducci leading the way, the young Ducks are in good hands. 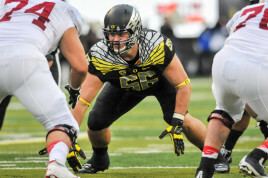 Stay tuned to FishDuck.com for coverage of spring practice and all your Oregon Duck news.